Abbey Farm in Eye, near Diss sleeps 10 people. Abbey Farm near Diss is tucked away in the Suffolk countryside; a spacious detached farmhouse, perfect for larger families. This beautifully renovated house offers comfort and luxury in equal measure. There are two wood burners for those cooler evenings and a stunning, mature garden for those warm evenings just to sit in and enjoy the surrounding countryside. 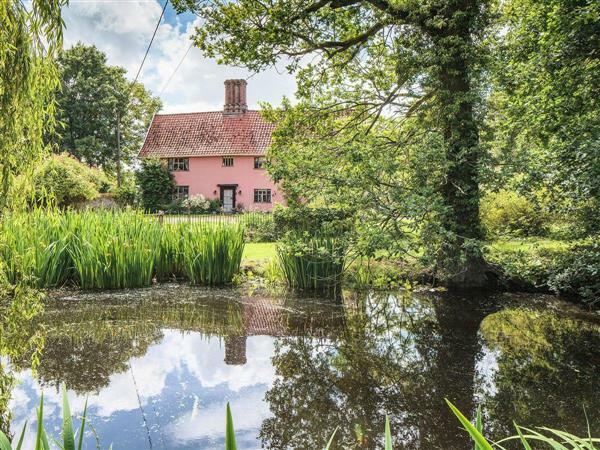 Ideally located in the small village of Thrandeston, guests can visit all that Suffolk and Norfolk has to offer, as you are located right on the border. The Suffolk Heritage Coast is only 25 miles away, where you can visit Southwold with its famous pier, Aldeburgh for its abundance of great food and restaurants, and Lowestoft, the most easterly point in the UK. If a drive isn’t in your plans, you can put on your boots and explore the many walks and cycle trails in the surrounding area. A particular favourite is the 12 miles of footpaths through The Thornham Estate, an ancient parkland, with woodland and farmland, as well as a Victorian walled garden. The shop is 3 miles, with a pub and restaurant 1½ miles from Abbey Farm near Diss. Living room: With wood burner, 42 Freeview TV, DVD player, CD player, beams and wooden floor. Dining room: With wood burner and beams. Kitchen: Farmhouse-style with gas range, microwave, fridge, freezer, dishwasher, beams and tiled floor. Bedroom 4: With double bed, Freeview TV and en-suite with bath and toilet. Oil central heating, gas, electricity, bed linen, towels and Wi-Fi included. Initial logs for wood burners included. Travel cot, highchair and stairgate. Welcome pack. Large enclosed, lawned garden with sitting-out area, garden furniture, gas barbecue and chiminea. Private parking for 3 cars. No smoking. Please note: There is a fenced pond in the garden, 10 yards away. Holidays at Abbey Farm run from Friday to Friday. For a better idea of where Abbey Farm is, you can see Abbey Farm on the map below. Abbey Farm is in Suffolk; should you be on the lookout for a special offer, you can find all the special offers in Suffolk. It's always worth checking to see what is on offer at the moment. Do you want to holiday near Abbey Farm (UKC1041), you can see other cottages within 25 miles of Abbey Farm; have a look to find your perfect holiday location.